AMRG is a search and rescue organization, which means before those in need can be rescued they first must be located. Sometimes the location is immediately known, but many times someone has failed to arrive at a destination and they must be found. 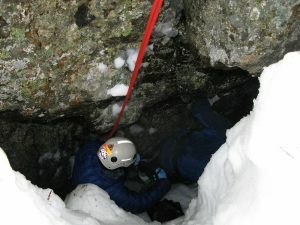 Operational members are taught the principles and skills needed to carry out effective search techniques, as wells as support skills to ensure that teams function at maximum effectiveness. All operational members are SAR Tech II certified. AMRG search managers are members with extensive training and experience in the latest search methods as well as skilled in the organization of an effective search effort. Many of AMRG’s search managers are also members of the Alaska Incident Management Team.